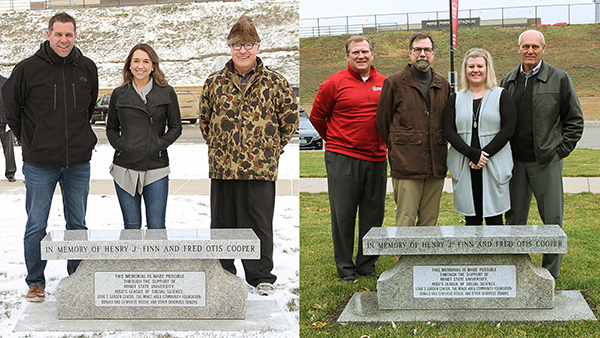 MINOT, N.D. – Minot State University, along with the Minot State Veterans Services office, had a final rededication ceremony for a memorial for two former MSU students, Henry Finn and James Otis Cooper, who died during World War I. The Veterans Day event started in the Westlie Room before moving outside to conclude the rededication efforts that began on Memorial Day acknowledging the sacrifices of Finn and Cooper. A memorial bench was placed in between two trees planted in May between the Gordon B. Olson Library and Swain Hall. 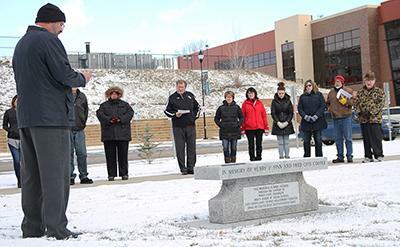 Along with honoring Minot State students who have served in the military, the rededication ceremony acknowledged the various donors for the memorial including: Minot Area Community Foundation – Donald and Genevieve Roush Fund, Minot Lodge No. 45 I.O.O.F., American Legion Auxiliary Unit 26, Milton and Bonnie Rolle, MSU League of Social Sciences, Lowe’s Garden Center, Joseph Jastrzembski, Calvin Grinnell, and Claudia Berg.